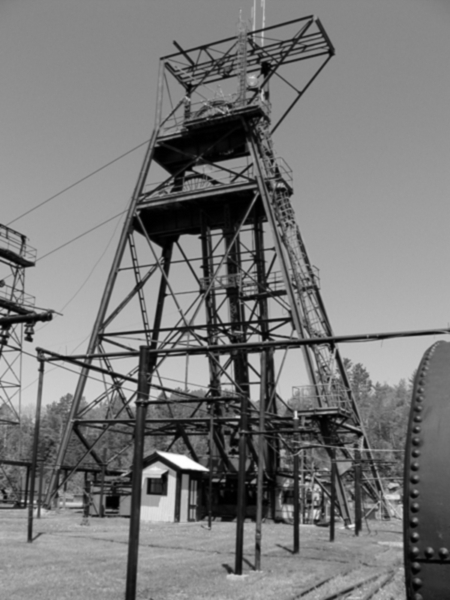 The headframe of the Soudan Iron Mine, which still operates the lift cage descending a half-mile below ground. I made this photograph look old because I felt like it. Greetings from northern Minnesota! Tomorrow, I will descend a half mile into the Soudan Iron Mine, where two particle detectors reside. The first is MINOS (Main Injector Neutrino Oscillation Search), which characterizes neutrinos originating from Fermilab. The second is CDMS (Cryogenic Dark Matter Search), one of a handful of detectors trying to find dark matter particles as they pass through Earth. I drove to the Soudan site today to take photos, since tomorrow’s forecast involves rain, but today was a beautiful clear day. Soudan—which is both the name of the town and the mine at its edge — is in northern Minnesota, a little north and west of the snout of Lake Superior, where it dips into the United States. (Soudan is ironically named for the Sudan in Africa, since their climates are nearly opposite.) While Soudan isn’t at the end of the road, it’s far from most population centers, much closer to the Boundary Waters and Ontario than it is to the state capital in St. Paul. The highway from my motel in Eveleth winds north through the towns of Virginia and Tower into the Vermillion Iron Range, a region of low hills pocked with iron mines. The route passes through forests of lakes, evergreens, and occasional wetlands—this is lumber and wild rice country. The sky was nearly cloudless, with just a few tuna clouds schooling their way eastward toward Lake Superior. A half dozen different species of butterfly fed upon dandelions, while ravens and vultures surfed the thermals overhead. In all, it was an exquisite spring day, bookended by rain, but itself a moment of sheer beauty. The old Soudan Iron Mine, which ceased operation in 1962, sits near the crest of the hill overlooking the town of Soudan. While it began as a pit mine, in 1900 a shaft was sunk deep into the hill, making Soudan the deepest iron mine in Minnesota. The superstructure has been preserved as a state park, and during the summer season, visitors can ride the cage lift down a half mile into the ground. The next day I would ride the lift myself as a tourist of a different sort. No sign I could find aboveground indicated that anything other than mining history was going on here—no hint of neutrino detectors or the search going on beneath my feet for the mysterious dark matter that comprises 80 percent of all matter in the Universe. If you look up the origin of the name Sudan, it comes from the Sudd, which is the boggy wetlands of Sudan. So perhaps the name makes sense? Obviously they don’t cite references and there’s no original quotation to back up the assertion, but the ironic explanation seems to be correct. However, I didn’t know that about the Sudan, so you taught me something! yeah, i read that too, but this regular visitor to crazy assertions in 19th century history books is still dubious without an original quotation. Ask around while you’re there! Well, if the state historical society doesn’t have the right answer, I doubt the locals will know any more. The town itself is much smaller now than it used to be—it’s not even incorporated now, probably since the mining is gone. I do wonder if the French spelling is a hint. Well, if the locals tell you the story then you can say in your book ‘the local story is ….’ and you won’t be wrong :) The SHS info is based on a book. So it would be helpful to see what the original book said as to where it got the information. But that’s not the purpose of your book. And those kind of ‘hints’ like a French spelling are exactly how these early books end up with misinformation! ‘Aha, since it is French he must have named it this because _____’ vs. ‘Bacon was quotes as saying he named it this because ____’.